Doing close up and/or detail work? At last, here is eyewear that can act like regular readers or magnifiers ideal for most intricate work in plastilina, moist clay, plaster, stone and/or wood. 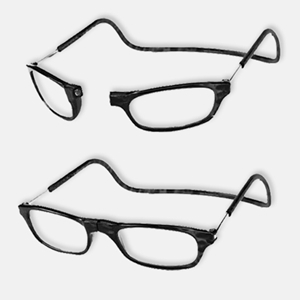 The patented magnetic closure, adjustable headband and neck strap allow the CliC eyewear to stay in place while wearing them. And they will not fly around your neck or fall forward when not in use. Rugged, lightweight construction for ergonomic and long durability. Available only in +3.00 strength for maximum magnification.